Background: A small GTPase Protein, the Ras-related Protein 1 (RAP1), abundant in platelets is known to be activated following agonist-induced platelet activation, suggesting that RAP1 downregulation could, in turn, reduce platelet activation in storage. Our objective of this study is to identify RAP1 regulating miRNAs and their role in platelet activation during storage. 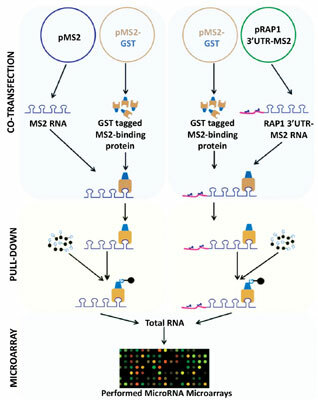 Methods: We applied MS2-TRAP (tagged RNA affinity purification) methodology to enrich miRNAs that target the 3’ untranslated region (3’UTR) of RAP1 mRNA in two mammalian cell lines followed by miRNA identification by microarray of total RNA samples enriched for miRNAs. Data analyses were done using different bioinformatics approaches. The direct miR:RAP1 3’UTR interaction was confirmed by using a dual luciferase reporter gene expression system in a mammalian cell line. Subsequently, platelets were transfected with one selected miR to evaluate RAP1 downregulation by this miRNA and its effect on platelet activation. Results: Six miRNAs (miR-320c, miR-181a, miR-3621, miR-489, miR-4791 and miR-4744) were identified to be enriched in the two cell lines tested. We randomly selected miR-320c for further evaluation. The luciferase reporter assay system confirmed the direct interaction of miR-320c with RAP1 3′UTR. Further, in platelets treated with miR-320c, RAP1 protein expression was decreased and concomitantly, platelet activation was also decreased. Conclusion: Overall, the results demonstrate that miRNA-based RAP1 downregulation in ex vivo stored platelets reduces platelet activation. Bioinformatics, mammalian cell, microRNA, platelets, RAP1, storage.